Ketut Madra and 100 Years of Balinese Wayang Painting is the catalog for the exhibition that ran at Ubud’s Museum Puri Lukisan from 7 October to 7 November 2013. But it’s much more than a catalog. 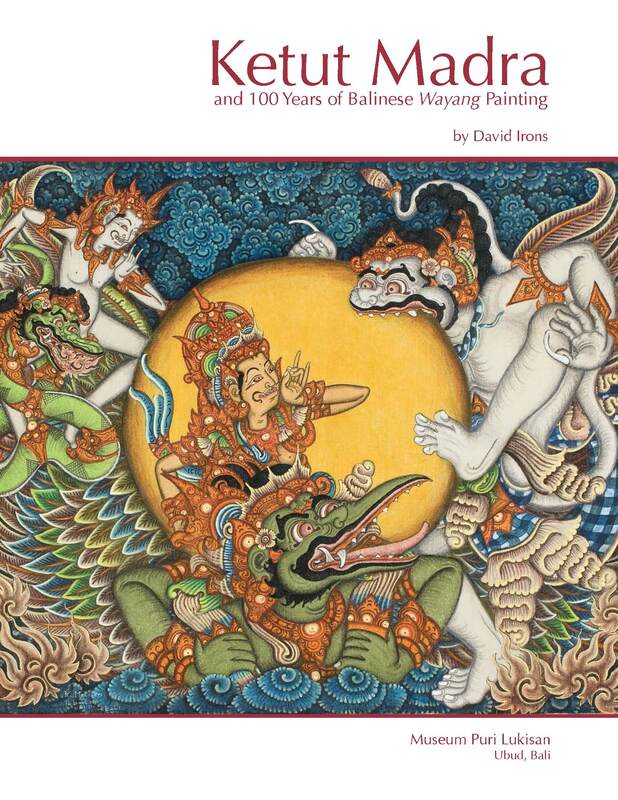 With essays on the origins and evolution of wayang painting in Bali and the life and career of Ketut Madra, the book is an important and accessible introduction to the oldest form of painted art in Bali. Over 64 large-format pages it includes all 69 paintings in the exhibition by Ketut Madra and 23 other artists in high-resolution photography that captures the remarkable detail of the work. Work from the late 19th Century to the present show the evolution of wayang art from its origins as sacred temple art to its varied modern interpretations by contemporary masters. The exhibition and the book examine works not only from the collection of David Irons of New York, the exhibition curator who lived in Bali for a year in 1973, but also important wayang paintings from the Puri Lukisan, ARMA, and other private collections in Bali, including that of Ketut Madra himself. For information on purchasing Ketut Madra and 100 Years of Balinese Wayang Painting, please click here. Ketut Madra and 100 Years of Balinese Wayang Painting offers an introduction to an art form unique to Bali. Focused on the senior wayang painter working in Ubud today, the exhibition and catalog also include work from 22 other artists of the past 100 years, mostly from the region around Ubud and from the village of Kamasan, south of Klungkung. 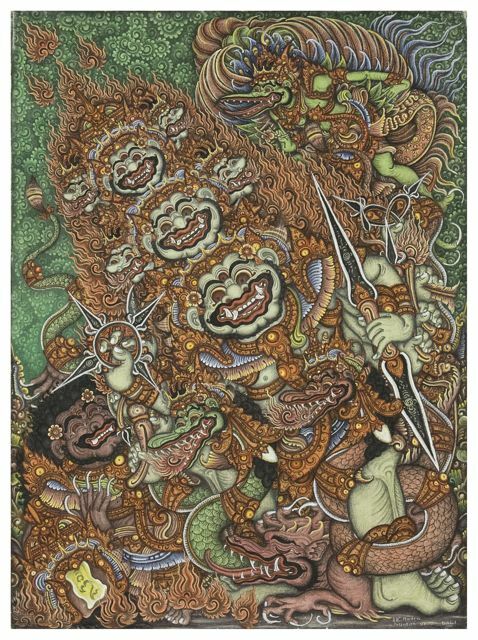 Inspired by the stories of gods, heroes, demigods, demons, and their servants, these paintings depict the epics of the Balinese Hindu–Buddhist religion and folk tales of Bali going back more than 600 years. Most Balinese of my generation learned these stories from the shadow plays, dance dramas, and other performances that accompany the ceremonies marking our passage through life and death. Wayang painting, the original illustrated art of Bali, takes its name from the shadow puppet theater – the wayang kulit – and uses its characters and iconography to tell our myths and legends. Until the 1930s, the purpose of almost all Balinese painting was to depict these stories in our temples and palaces. These painted narratives of Java and Bali, like the puppet theater, carry lessons about the behavior of mythological beings and humankind. Wayang art – devotional, decorative, and educational, painted on ceilings, external and internal wooden panels, or on hand-woven cotton or bark cloth – enhances our ceremonies. We read and understand these paintings as part of our lives and know their standard conventions like the faces of familiar neighbors. Gods and heroes tend to be lighter in body color, with narrower eyes more refined teeth. Giants, demons, and unrefined characters prone to anger are darker, usually painted in deeper reds or browns, with rounder and more pronounced eyes, and sharper, animal-like teeth. Higher-born characters – kings and princes – occupy higher territory in the painted scenes in which they appear; lower-status ones appear below them, often imitating and sometimes mocking the ways of their masters.